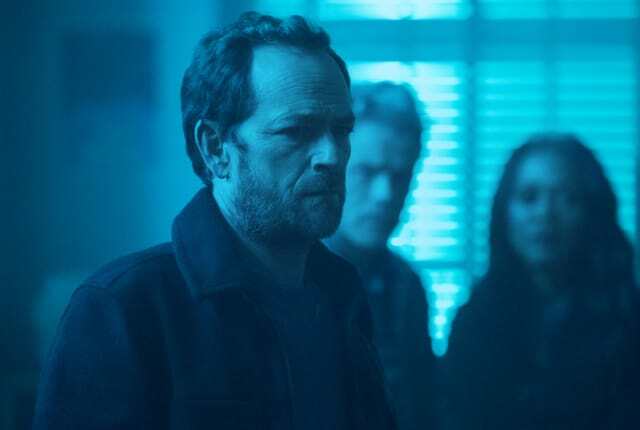 Watch Riverdale Season 3 Episode 12 online via TV Fanatic with over 1 options to watch the Riverdale S3E12 full episode. Affiliates with free and paid streaming include Amazon. On Riverdale Season 3 Episode 12, The Midnight Club is brought back together by a mysterious individual, and Veronica and Reggie work to clean up a mess they caused. Josie: I don’t know if you’ve heard, but my mom is getting married to Kevin’s dad. And I wanted to know if you would be my date for the wedding? Sweet Pea: As your boyfriend? Josie: Does it have to be so official? Sweet Pea: Josie, I like you and I would be with you, all in with you in a second. But, you sliding into my life when you don’t want to be alone ... I’m not built that way. Maybe that makes me needy, but I just ... I’ve got to get off this merry-go-round with you. Permalink: Does it have to be so official? Cheryl: Please, I have eyes. I saw you lounging together at my pool party looking like a community theater production of the Talented Mr. Ripley. The Moose ship has been trouble from the gay get-go. Maybe it’s time you move on? Kevin: I can’t go back to Fox Forest. Cheryl: Oh, sullen tender-hearted Kevin. I’m not talking about cruising, I’m talking about Bumble. Permalink: Oh, sullen tender-hearted Kevin. I’m not talking about cruising, I’m talking about Bumble. Riverdale Round Table: Are You Shipping Josie and Archie?